Polbase - Reference: Structural insight into recruitment of translesion DNA polymerase Dpo4 to sliding clamp PCNA. Structural insight into recruitment of translesion DNA polymerase Dpo4 to sliding clamp PCNA. DNA polymerases are co-ordinated by sliding clamps (PCNA/beta-clamp) in translesion synthesis. It is unclear how these enzymes assemble on PCNA with geometric and functional compatibility. We report the crystal structure of a full-length Y-family polymerase, Dpo4, in complex with heterodimeric PCNA1-PCNA2 at 2.05 A resolution. Dpo4 exhibits an extended conformation that differs from the Dpo4 structures in apo- or DNA-bound form. Two hinges have been identified in Dpo4, which render the multidomain polymerase flexible conformations and orientations relative to PCNA. Dpo4 binds specifically to PCNA1 on the conserved ligand binding site. The C-terminal peptide of Dpo4 becomes structured with a 3(10) helix and dominates the specific binding. The Y-family polymerase also contacts PCNA1 with its finger, thumb and little finger domains, which are conformation-dependent protein-protein interactions that diversify the binding mode of Dpo4 on PCNA. 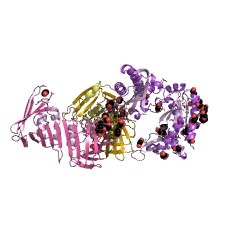 The structure reveals a molecular model in which substrate/partner binding-coupled multiple conformations of a Y-family polymerase facilitate its recruitment and co-ordination on the sliding clamp. The conformational flexibility would turn the error-prone Y-family polymerase off when more efficient high-fidelity DNA polymerases work on undamaged DNA and turn it onto DNA templates to perform translesion synthesis when replication forks are stalled by DNA lesions.